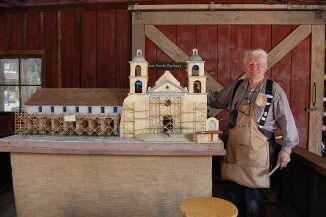 In the early 50’s, Knott’s Berry Farm, an amusement park in Buena Park, California, commissioned a series of models of the California missions. The models were displayed for many years, but were retired in 1998. The mission models deteriorated in storage, but after a three-year restoration effort, they are now being placed on display once again. The models were restored by Bob Weir, a veteran wood carver who has been employed at Knott’s for more than 20 years. In addition to their historical and educational value, the models hold a sentimental attraction for many visitors who saw them as children.